Terri McCarthy, local artist, instructor and metalsmith from Grafton, WI visited Cool Tools to create these "How to" videos. In these two basic soldering videos, learn how to solder an earring post to create an earring with textured metal and in the second video, Terri demonstrates a technique using white-out to keep solder exactly where you want it, eliminating solder in unwanted areas. The tools and supplies are listed below. This 12 inch soldering pans rotate 360º with easy access. The heat reflecting pumice is perfect for supporting your project in any position - flat or embedded. This pan comes with an attachable third hand custom designed to fit with our pans. Each pan includes pumice. 7" diameter annealing pan on lazy susan rotating base. Include pumice. Convenient and easy to move in and out of place for soldering and firing operations. Steel pan is 2" deep. Powerful, portable Anti-flare butane refillable torch features a strong and sturdy brass flame nozzle, detachable base and precision flame control. Block includes 4 circles at 3/4" deep with diameters measuring at 4", 3-1/2", 3" and 2-1/2". Durable and powerful general purpose flux that protects your parts up to 1600°F / 870°C. It is an active fluoride-type flux which is appropriate for all nonferrous metals and begins to melt and dissolve oxides at 600°F / 320°C. Paste formula can be cleaned up with hot water. If you are using one of our paste solders, you do not need this flux. Paste solder has the flux already mixed in. You'll need flux when you solder using chip or wire solder. Handy-Flux can be used on gold, silver, brass, and copper, however most jewelers prefer this type for silver. Includes 8 drop shapes, 2 styles. Sizes are from 27mm to 75mm. p>Use this studio sized crock pot to hold your pickle or other warm liquids at a constant temperature. The Little Dipper crock pot looks great in the studio and makes the perfect small pickle pot for jewelry artists. Make pickle and other solutions in batches up to 16 oz. Glazed black stoneware crock with stainless steel body is only 5-3/4" in diameter. This container features an indented design that allows placement of your paint brush across the top in between use. Liver of sulfur in a stabilized gel form. Made in the USA. Cool Tools Patina Gel is liver of sulfur in a stabilized gel form. Not only is it the most convenient, easiest way to use liver of sulfur, but amazingly it does not degrade in light and air the way dry and liquid liver of sulfur does. Cool Tools Patina Gel is economical. Use only what you need with our no-mess dispenser spout. No more digging for the "right sized chunk" or wasting pieces that are too large. No more throwing out a whole container because the lid was not on just right. Patina Gel is always fresh and always ready to use, and just a few drops is all you need. Cool Tools Patina Gel is safe. Ordinary lump sulfur is flammable. Cool Tools Patina Gel's unique chemistry makes it non-flammable and safe for international shipping. Cut string, cord and other stringing materials. Cut fine silver and copper wire to 16 gauge. Ergonomic handles. Silver Prep is an all natural non-toxic pickle mix that is used to dissolve surface oxidation and flux residue from a metal's surface. It can be used as a traditional pickle for fine silver, sterling silver, copper and gold. Silver Prep is used to depletion gild sterling silver to fire directly in metal clay or to fuse metal clay directly to sterling silver during firing. Silver Prep allows you to fire sterling silver directly with precious metal clay. You can apply metal clay to sterling silver or embed sterling silver into metal clay and fire together in the kiln or with a torch. Any item made of sterling silver (including Argentium) can be embedded and fired in place. PMC3 is recommended for kiln firing, however PMC Plus or PMC3 can be used when firing with a torch. SilverPrep is easy to use, non-toxic, organic and earth friendly! SilverPrep can be saved and used again and again. Watch our video below showing how to co-fire sterling silver and precious metal clay to add strong sterling findings to your metal clay creations. Click on our Silver Prep Instructions to download instructions for using our Natural Pickle Mix. Use to cut solder or granules from wire or sheet. Titanium solder pick will not stick to solder! No more sanding off solder slobber. Color may vary. Hard board dissipates heat quickly. Non-asbestos board can be drilled or cut as needed. This brass textured sheet is 22 gauge and is 2” x 6”. Use brass textured sheet metal to make and form your own jewelry designs. Red brass can be considered both a brass and a bronze. It typically contains 85% copper, 5% tin, 5% lead, and 5% zinc. Red brass is widely considered to offer a good mixture of corrosion resistance, strength, and easy work-ability. 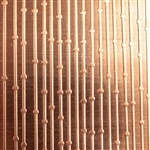 This bronze textured sheet is 22 gauge and is 2” x 6”. Use bronze textured sheet metal to make and form your own jewelry designs. Bronze is a metal that has been used for many things for hundreds of years. Bronze is a copper alloy, which offers additional strength when you need it most. 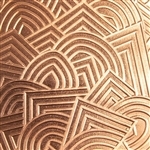 This bronze textured sheet is 22 gauge and is approximately 2”x6”. Use bronze textured sheet metal to make and form your own jewelry designs. Combine textures with other popular mediums like metal clay, various wire, findings and more. Let your creative aspirations run wild! Red brass is a great and inexpensive base metal for making jewelry. Red brass is versatile, and works wonderful with both brass and bronze. Combine textures with other popular mediums like metal clay, various wire, findings and more. Textured sheet is approximately 2”x 6”. gauge brass sheet. Approximately 2" x 6"
What a timesaver! This automatic torch lighter allows you to light any torch using only one hand. It's amazing how much more efficient soldering can be when you have a striker. Comes complete with 2 AA batteries. Great for soldering small parts! Squeeze to open, place your part into the jaws and release. Your part is locked in place, allowing you hold your part easily for positioning, viewing or soldering without worry of losing the piece. Economy stainless steel tweezers. 4-1/2" long. Use for general purpose or fine soldering tasks. Economy grade but well made. Keep several different sizes and types of tweezers on hand.